Collection of definitive and commemorative coins of Republic India including Off Metal Strikes (OMS), Mules,Die varieties and Errors. This Nickel-Brass 5 Rupees commemorative coin was released in the year 2009 to commemorate saint Alphonsa’s birth centenary. However in case of this commemorative coin released from Mumbai Mint we can find an interesting die variation on the reverse side. The detailed differences are marked in the below given image. From the above given image we can clearly make out six difference in the type-I and type-II reverse sides. In case of Type-I the leaf A behind the rose is oval shaped with relatively pointed end whereas in case of type two this leaf is blunt and have flattened end. Secondly, coming to right lateral leaf B, we can clearly observe that type one have oval shaped leaf whereas type-II has elongated narrow leaf. Third observable difference is in the leaf C just besides the flower stalk. Type-I reverse have fully visible oval shaped leaf whereas type-II have partially visible triangular leaf. Forth observable difference is that, the type-I reverse have a thick stalk ending whereas type-II have thin stalk ending. The more clearly observable difference is in the leaf E. Type-I have small blunted leaf whereas type-II has large leaf with pointed end. Lastly, leaf F has very minute but observable differences in the leaf curving. 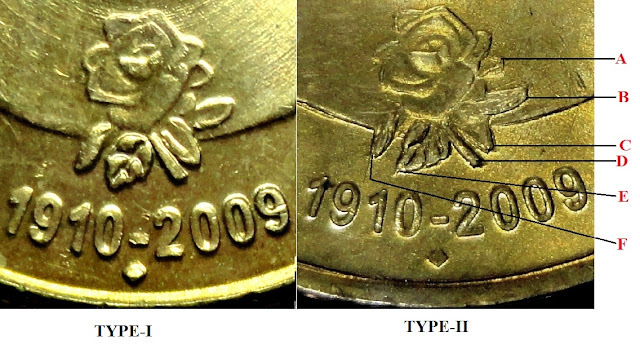 In addition to these six variation we can even clearly make out differences in the finishing of the coin. Type-I have normal finishing whereas type-II have a far better finishing with exceptionally good strike. Shridhar Patil CONTACT: +91-88822-86999 E-mail: srisr8@gmail.com. Awesome Inc. theme. Theme images by Airyelf. Powered by Blogger.